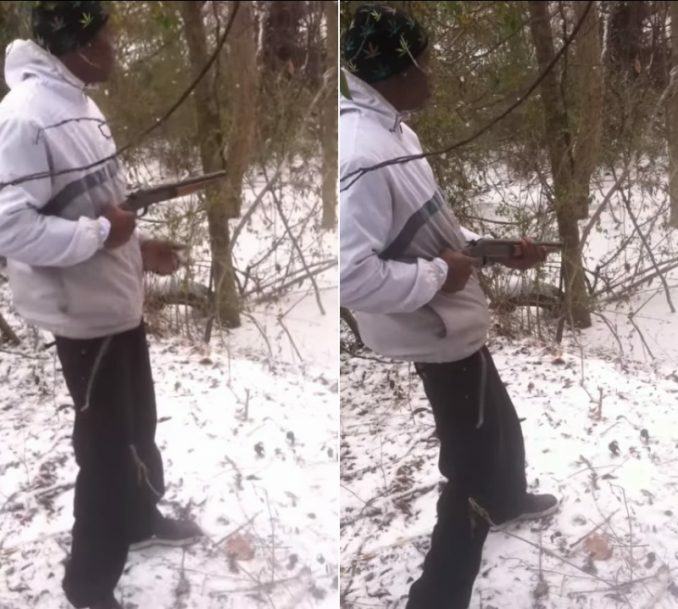 Poetic justice was caught on video after a foolish man decided to take a sawed-off shotgun out for a test run. Let’s just say it didn’t go according to plan, and he quickly realized just how big of a mistake he had made when he pulled the trigger. 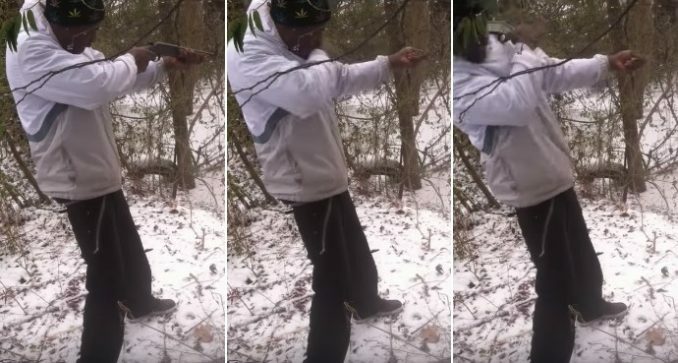 A young man, wearing a hat with the depiction of a few marijuana leaves, was recorded on video while taking a sawed-off shotgun out for a little bit of fun. Although it’s unknown when the incident actually took place, it appears to be during the winter months, as there is snow on the ground. The gun seems to belong to the man recording the incident, as the shooter asks shortly after the video begins where to shoot it. The cameraman only suggests that he “hip fire” the gun, meaning it would be at about waist level at the time of discharge. This is where things go wrong – oh, so very wrong. Ignoring the warnings of the gun’s owner, the nitwit raises the firearm to face level, but there’s just one problem – the gun doesn’t have a stock. As would normally be the case, the force of the weapon firing (recoil) would transfer through the stock and into the torso of the shooter. Without this stabilization, the sawed-off shotgun is forced back with only the hope that the hand of the man firing the gun can control it. Unfortunately for this “gangsta,” that wasn’t the case – not by a long shot. It’s all too easy to get caught up with what we see in the movies, and that was apparently the case here. Anyone who has fired a shotgun before knows that it comes with a hefty kick. As for this guy, he just thought it was going to be a little “pop.” This is proven by where he held the gun just prior to firing. The stock is a very important part of the firearm, and when you don’t have one, especially on a shotgun, it makes it just about impossible to keep steady. So, when this guy got hit in the face, it was his own fault, seeing how he didn’t leave the proper amount of room to accommodate the full brunt of the recoil. Instead, he caught it with his face. It just goes to show, you always need to have some background knowledge before firing a weapon of any kind. If not, well, you could end up making a complete fool of yourself like the guy in the video. This is why gun safety is so important and why more people need to take it seriously. Morons like this guy only give gun-grabbers more ammunition when it comes to trying to take away our legal guns. Be smart – don’t be this guy.